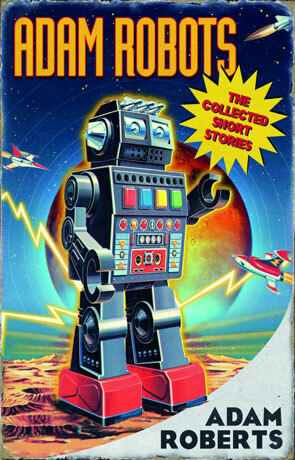 Adam Robots is a collection of science fiction shorts by the irrepressible author Adam Roberts. Each little story explores a different style, sub-genre or convention and yet each is quite clearly a product of the authors mind. There is a certain momentum to Roberts prose, a hustling and yet elegant style that is very disarming. His intelligence is also always evident as is his sheer enthusiasm for the genre and this energy bubbles from the pages and infects the reader. It's his command of our fair language that really set's him apart though, as evidenced in all his works he seems to really enjoy playing and experimenting with the English language. Fellow author Jon Courtenay Grimwood has gone as far as to call Roberts "King of High-Concept SF" and it's a title well earned; if you haven't read any of his books yet then this would provide the perfect introduction. Each of the twenty four stories within this collection are markedly different and in many of them the author turns convention upon it's head or otherwise subvert one of the myraid sub-genre's that are included. He even plays with a few classic tales leaving enough to recognise but different enough to stand out. I don't often get the opportunity to read short story collections and so when I do it makes a nice break, especially when the collection is of such quality as presented here. If anything it's the imagination and the sheer quality of the prose that makes this collection unforgettable, it feels like one of those classic tombs from Bradbury or Pohl and yet is decidedly 21st century and modern in form. Each story is a little gem in it's own right, each one awakens the imagination, gets you thinking of alien worlds, time travel, deep space or even on one occasion following Macbeth. Adam Robots is a remarkably clever, fun and thoughtful journey; a veritable delight for any science fiction fan, Roberts just seems to get better with each book. Written on 22nd March 2013 by Ant.